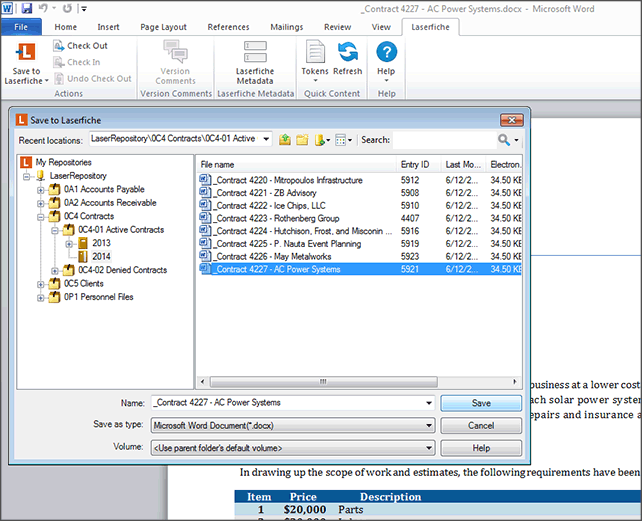 Laserfiche’s built-in scanning interface connects directly to your scanner to process paper documents from any file format. Document imaging management has never been easier. Clean up image quality and apply enhancements to scanned documents. Make all incoming documents full-text searchable for future search and retrieval. Automatically separate and sort scanned documents into the right folders. Schedule automatic import with digital document imaging. The Laserfiche Mobile app offers a mobile document imaging system to create content and work with documents on iOS, Android and Windows devices. It's your own mobile document imaging system. Turn photos taken with phones and tablets into digital documents. Make all content captured on mobile devices full-text searchable. Initiate and participate in automated business processes from anywhere. Capture fragile, archival or odd-size text documents and transform them into digital, searchable files without purchasing a specialized scanner. Our document imaging system connects directly with standard office tools. Save documents directly from Microsoft Office applications. Drag-and-drop electronic files into document repositories for easy storage. Convert working documents into archival formats for permanent storage. Import documents from e-mail, including attachments, with one click. Reduce manual scanning and indexing by capturing precise pieces of information from paper and electronic documents. Automatically sort and categorize incoming documents, fill out fields and create folder paths based on image data, barcodes, page size and more. Capture information from databases to simplify metadata import. Initiate document routing workflows based on document processing.